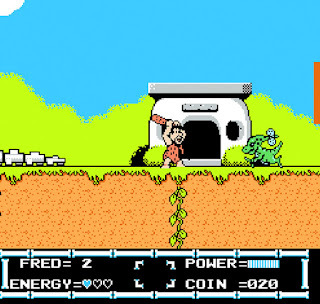 The Flintstones: The Rescue of Dino and Hoppy is a platform game that's based on The Flintstones animated TV series. The mission is to reclaim the pieces of Gazoo's time machine, and rescue your pet dinosaurs from Dr. Turner. Your main attack is a club, but special weapons are available in the form of a Slingshot, Bomb and Axe; each can only be used by collecting coins from opponents. 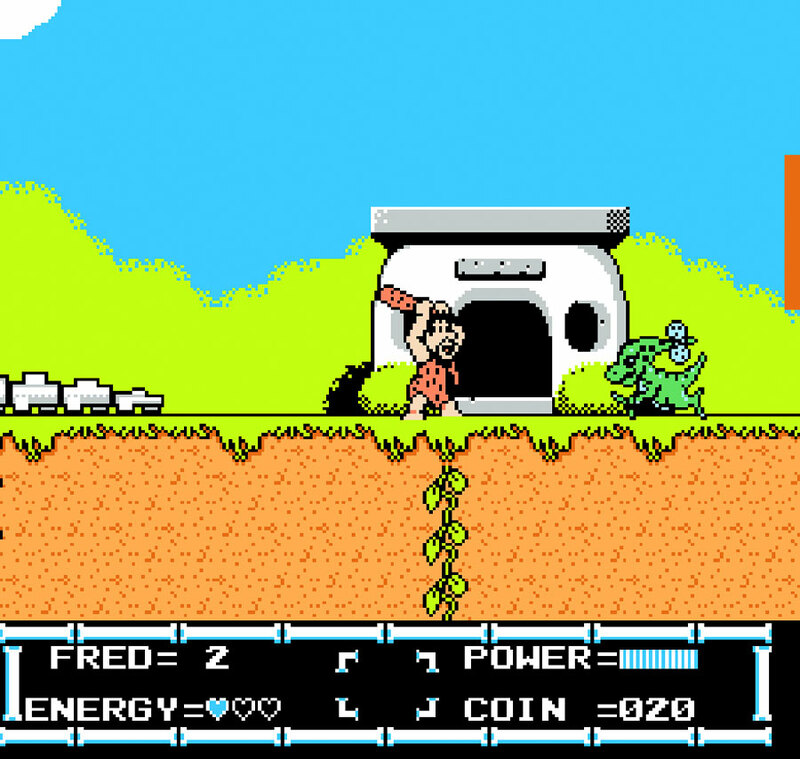 The gameplay is your typical platforming fare, except Fred can grab onto ledges to pull himself up, and catapult to reach higher platforms. The controls are tight and while the special weapon mechanics are copied from Castlevania (1987, NES) its intuitiveness works to the game's benefit. The collision detection is inconsistent though, as sometimes your club will clearly overlap an enemy sprite and do no damage; likewise, you can clip through some bosses without consequence. To its credit, the game does feature varied locales so you always feel like you're progressing through an adventure. Highlights include the maze-like Castle, and the final level which is reminiscent of Metal Man's stage from Mega Man 2 (1989, NES) with its spikes and travelators. Unfortunately, an obligatory ice stage is present and Fred's extreme momentum frequently puts you in harms way! While the overall platforming is decent, the level design doesn't do anything to surprise, and the game has none of the personality from the TV show. At least it isn't linear thanks to its stage select hub, which is where you find the one-on-one basketball mini-games to earn Wings (flight), Jumpers (long jump) and Flippers (diving suit). These are handy, but too easy to obtain, as you can score and then continually circle your opponent until time runs out! The Flintstones: The Rescue of Dino and Hoppy borrows elements from classic NES titles to form an above-average platformer that does a lot of things well. It's just a shame that the developers didn't spend more time being creative with the level design, as this flaw prevents it from reaching the lofty heights of its predecessors. Random trivia: A sequel called The Flintstones: The Surprise at Dinosaur Peak! was released on the NES in 1993.